A long-hidden narrow void in the Great Pyramid of Giza has been found by scientists in a discovery that could finally reveal the secrets of the 4,500-year-old monument. The void stretches for at least 30 metres (100ft) above the Grand Gallery – an ascending corridor that links the Queen's chamber to the King's in the heart of the pyramid. It is not known why the void exists or if there are any valuable artefacts inside as it is not obviously accessible. But it has similar dimensions to the Gallery, which is 50 metres (164ft) long, eight metres (26ft) high and around a metre (3.2ft) wide. Researchers suggest it could be a 'construction gap' – part of a trench that allowed workers to access the Grand Gallery and King's Chamber while the rest of the pyramid was built. The discovery was made after physicists took images of the inside of the pyramid using particles fired to Earth from space. These cosmic particles penetrate the rock in a similar way to X-rays, only much deeper. The collaborative effort, between archaeologists, historians and physicists, has been hailed as the biggest discovery inside the Giza landmark since the 19th century. Made under the watch of the Pharaoh Khufu and completed in around 2550 BC, Egypt's Great Pyramid, or the Pyramid of Giza, served as the world's tallest man-made construction for thousands of years. 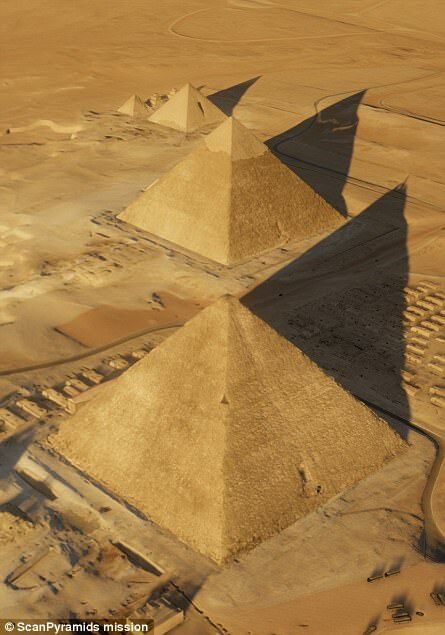 The structure, also known as Khufu's Pyramid, is the sole survivor of the ancient Seven Wonders of the World. Scientists say the latest discovery, published in the journal Nature, could help shed light on its construction. The scientists made the discovery using cosmic-ray imaging, recording the behaviour of subatomic particles called muons that penetrate the rock. This allowed the pyramid's insides to be seen without physically disturbing it, as the results showed empty space differently from rock. The presence of the space, dubbed the ScanPyramids Big Void, was confirmed using three different detection technologies over several months after first being spotted, the paper said. The results were then analysed three times. 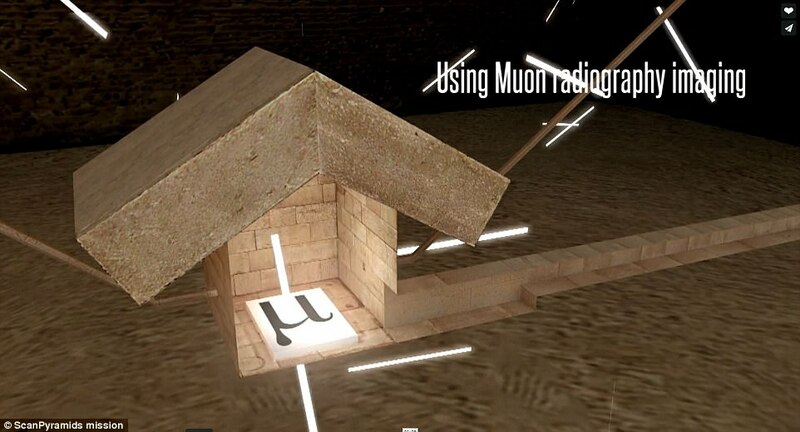 The ScanPyramids mission is made up of researchers from Egypt's Ministry of Antiquities, the University of Cario, and the non-profit organisation the Heritage Innovation Preservation (HIP) Institute. 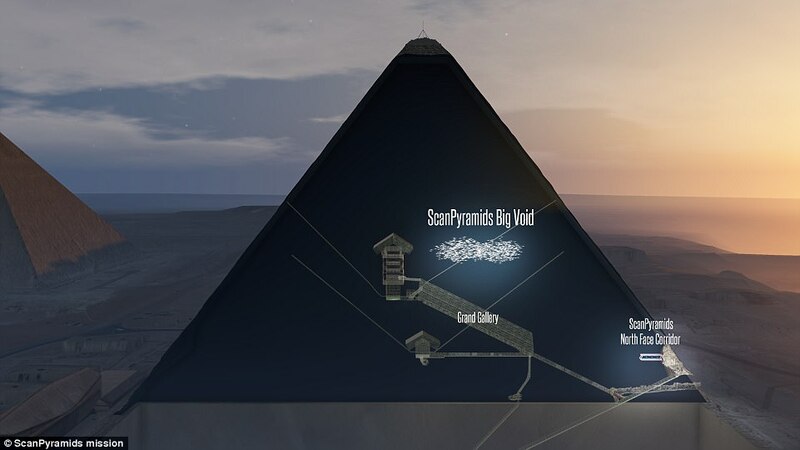 'ScanPyramids Big Void is not a room or a chamber – we don't know if it is horizontal or inclined if it is composed by one or several successive structures, but it's big,' report author Mehdi Tayoubi, president and co-founder of the HIP Institute, told MailOnline. 'The Grand Gallery is an internal spectacular internal structure (47m long, 8m high) a kind of internal cathedral at the centre of the pyramid. The detectors work by using cosmic particles known as muons that have the power to penetrate deeply into most materials. The subatomic particles require only a few special instruments because they rain down naturally from the atmosphere above. Muons are created when the upper atmosphere reacts with cosmic rays, producing a shower of particles, some of which decay into muons. The elementary particles, which weigh around 200 times more than electrons, can very easily pass through any structure, even large and thick rocks like mountains. Researchers can use these tiny particles to measure the density of structures, just like X-rays pass through our bodies to visualise our skeleton. Report author Mr Tayoubi said: 'This structure is not accessible, we don't see (that) people tried, if you look at the Grand Gallery, to access the void which is above. 'So this void was hidden, I think, since the construction of the pyramid, it was not accessible. 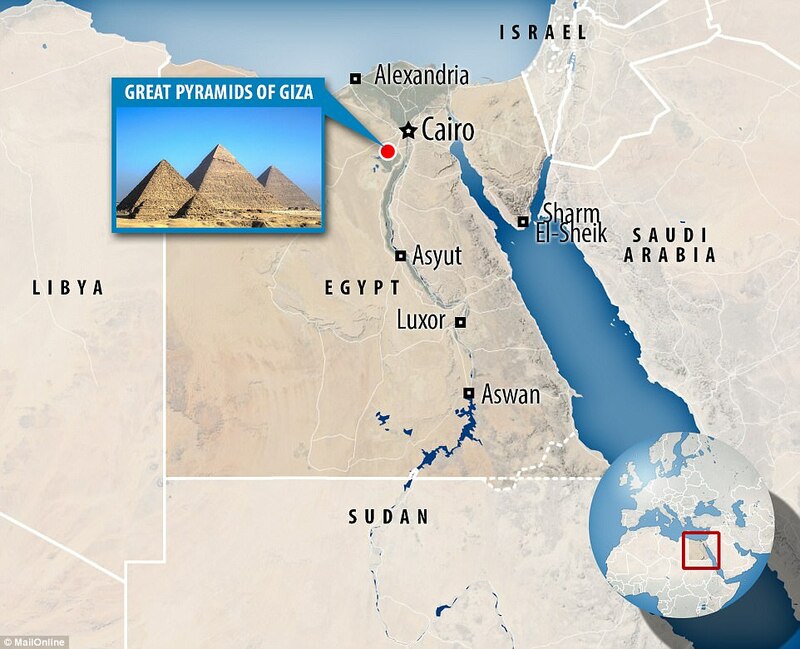 An apparent void lying undiscovered deep inside the Great Pyramid of Giza has been discovered by scientists. The internal structure is located above the Grand Gallery – that links two of the pyramid's chambers. It traces a similar route for at least 30 metres (100ft). 'This was a study about physics, it was not about Egyptology – we are not claiming anything about interpretation for this void – we are just claiming that there is a void and that's all,' study author Mehdi Tayoubi said. He added they were 'very confident' the results were correct. Because no one has physically seen inside the void, what it was built for remains a mystery. 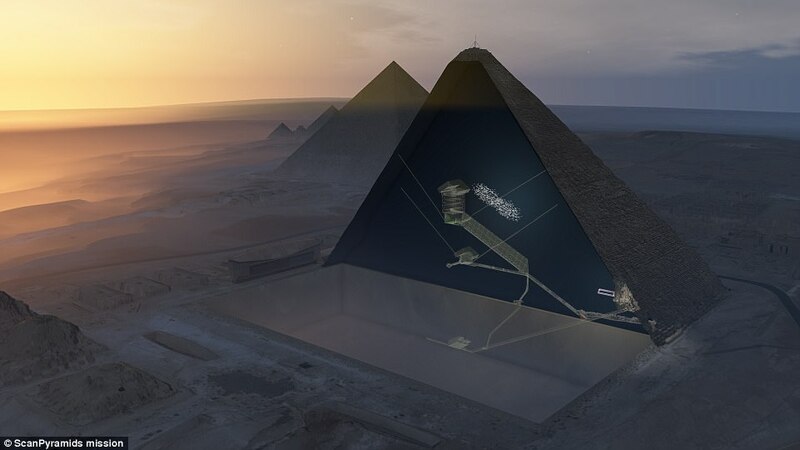 Researchers claim the space could be on an incline, which means it could have been used to transport huge blocks into the centre of the pyramid and was then left, experts said. 'This finding is very exciting, but I don't think it's likely to be some kind of secret chamber,' Dr Kate Spence, an archaeologist at the University of Cambridge who was not involved in the study, told the Telegraph. 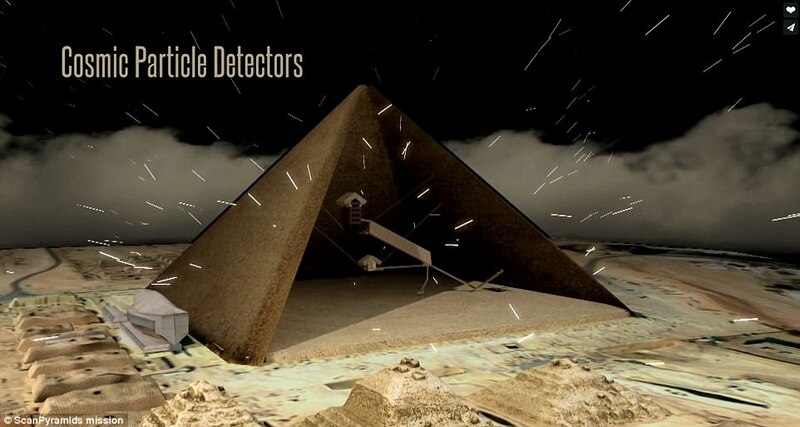 Over the course of their lengthy study, the team have used several techniques to scan Egyptian pyramids. – Infrared detects infrared energy emitted from object, converts it to temperature, and displays an image of its temperature distribution to reveal objects that may be hidden. 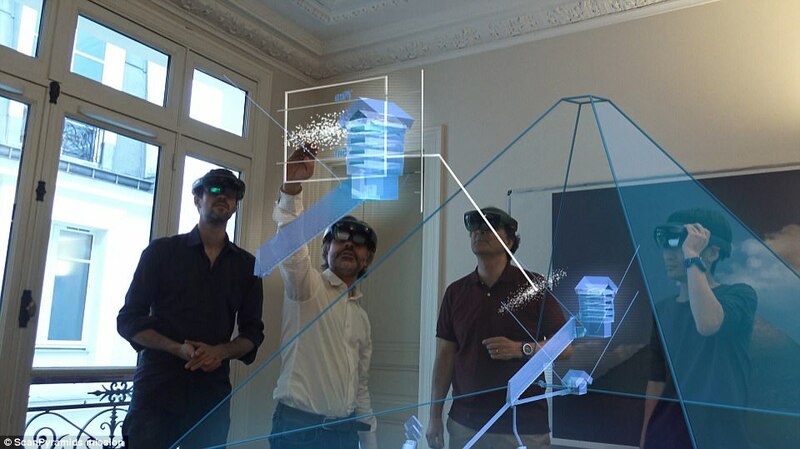 – Lasers bounce narrow pulses of light off the interiors of a structure to map it in detail. Once the scanning is complete, the data can be combined into a highly detailed 3-D model. 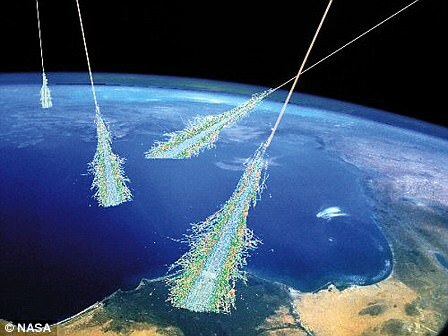 – This detects muons that are created when cosmic rays hit the atmosphere. Muons pass harmlessly through people and buildings. 'I think it is an inclined ramp that was used to transport huge blocks into the centre of the pyramid and then left. The orientation leads up to the huge granite roof struts at the top of the relieving chamber. 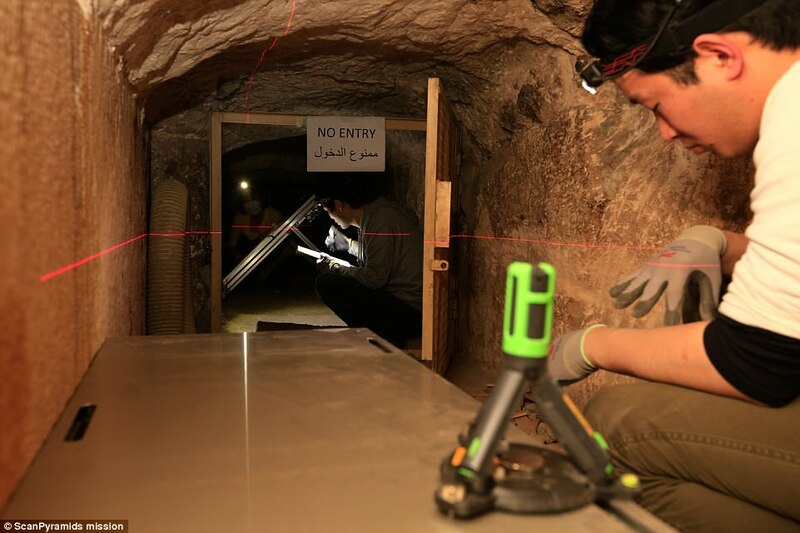 Researchers from the Egyptian Ministry of Antiquities' scientific committee suggest it could be a 'construction gap' – part of a trench that allowed workers to access the Grand Gallery and King's Chamber while the rest of the pyramid was built. More simply, the void may have simply been left there to relieve weight from the Grand Gallery below. The team's finding has been a long time coming after months spent trying to find the elusive 'void'. The researchers began using muon technology, thermal scanning and 3D laser mapping to lay out the pyramid's internal structure in 2015. 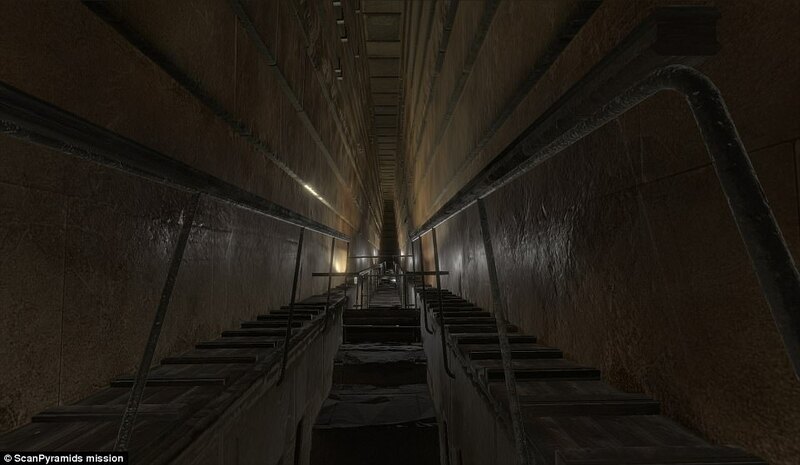 Scanners placed in the Great Pyramid's grand descending corridor, as well as a tunnel near the north facing entrance dug out by medieval explorers, found a small structure above the structure's entrance in 2016. Thermal imaging of the pyramid confirmed a human-height, corridor-shaped void that ran parallel but above to the descending corridor. Researchers realised this corridor, labelled the ScanPyramid Northfacing Corridor, must lead somewhere, and spent the following months using mapping technology to find where it led. This has now led the team to the new structure, which sits above the pyramid's Grand Gallery. They added that the development 'show how modern particle physics can shed new light on the world's archaeological heritage'. 'This was a study about physics, it was not about Egyptology – we are not claiming anything about interpretation for this void – we are just claiming that there is a void and that's all,' Mr Tayoubi said. For more than 4,500 years, Egypt's pyramids have kept their secrets hidden deep within the labyrinth of passages and chambers that lie inside their towering stone structures. 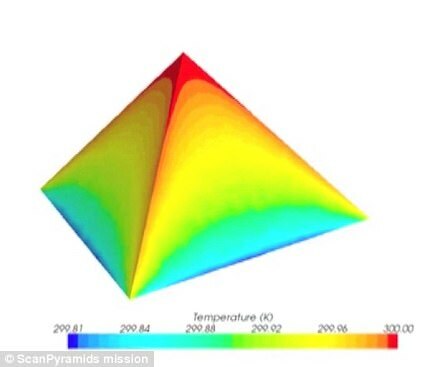 A team of experts then set up the ScanPyramid's project to use muons, tiny subatomic particle that are typically produced by cosmic rays smash into atoms on Earth, to peer through the pyramid's huge stone blocks, some of which weight up to 15 tons. He recently clashed publicly with British Egyptologists over their theory that a secret burial chamber may be hidden behind the walls of Tutankhamun's tomb in his pyramid in the Valley of the Kings. Yesterday it was reported that archaeologists in Egypt have reopened a 'cursed tomb' containing the remains of the people who built the Great Pyramid of Giza to visitors. It is the first time it has been opened to the public since its discovery almost 30 years ago. The area dates back 4,500 years and is located in the 'tribal mountain' area, near the Pyramid of Giza. The Press Office of the Ministry of Antiquities shared the revelation on Instagram with a picture of the area, saying 'Opening the workers cemetery site at Giza Plateau to visit'. The newly opened area contains a cemetery of workers along with the graves of the supervisor of the royal palace, the supervisor of the construction workers and a man of significance who was buried with the workers, accordingto Newsweek. The site has been closed off since 1990. 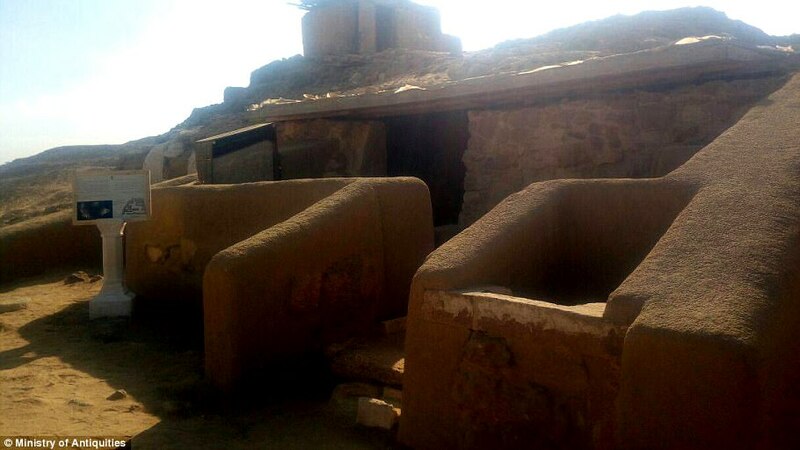 Archaeologists from the Ministry of Antiquities believe the man who supervised the workers filled the cemetery with curses to protect the dead from thieves. This has now led the team to find the new structure, which sits above the pyramid's Grand Gallery. 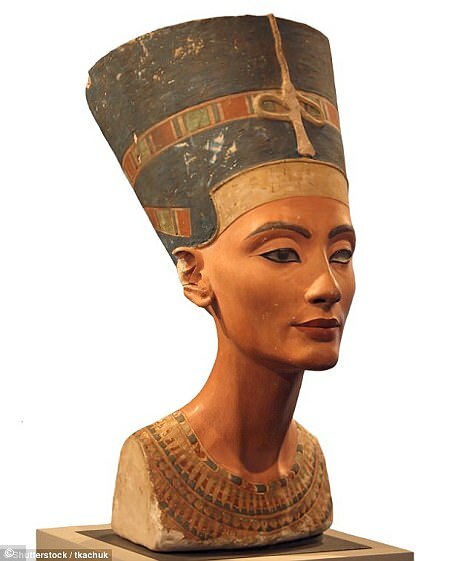 Some archaeologists have pinned hopes on using the sophisticated technology to locate the burial place of the legendary queen Nefertiti. The wife of King Akhenaten, who initiated a monotheistic cult in ancient Egypt, queen Nefertiti remains an enigma, best known for a bust depicting her that is now on exhibition in Berlin's Neues Museum. 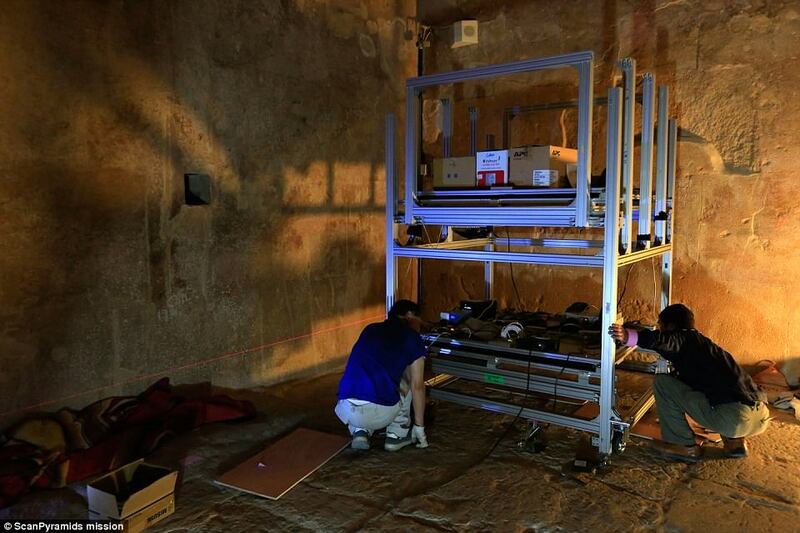 In 2015, archaeologists scanned the tomb with radar hoping to find clues.